Make your garden chameleon and wildlife friendly, and you’ll be greatly rewarded! I recently paid a visit to two friend’s properties. Their gardens were both full of indigenous plants, from the ground covers and shrubs, to the tallest of trees. 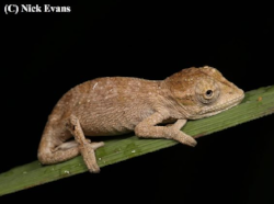 Unsurprisingly, because of this, they had healthy populations of KwaZulu Dwarf Chameleons (Bradypodion melanocephalum), a species listed as Vulnerable. But the gardens were not just home to chameleons. Chameleons need food of course, insects, and these gardens were full of them. I was quite amazed at how my friend’s garden, in Westville, was buzzing with different moth species, some being very pretty. And, we saw a variety of sleeping insects. Yesterday, whilst walking in my mum’s garden (which I turned indigenous 2-3 years ago, an ongoing project), I was impressed with how many bees and butterflies were around. By planting indigenous plants, your gardens will too be a buzz with wildlife. In my mum’s garden, since turning it indigenous, we’ve counted over 60 species of beautiful birds. A friend has a healthy population of Dassies, which love feeding on his array of indigenous plants (especially the “Bird Berry”, Psychotria capensis). An indigenous suburban garden plays a big role in suburban conservation. By planting indigenous, you are creating precious wildlife habitat. And as you’ll know, that’s on the decline. IMPORTANT! Don’t use pesticides. If a caterpillar is feeding on your plants, don’t kill it. You want caterpillars there! One day, in return, you may have sightings of stunning butterflies or moths. Also, Cuckoos and other birds love caterpillars. Let wild, native animals feed on your plants. The plants are food. Plus, if your garden is free of pesticides, you’ll have natural predators coming in to take care of what you may consider pests (photos below). I’ve noticed an impressive number of Praying Mantises in the garden, feeding on all the insects, as well a few lizard species (Dwarf Geckos, Skinks, Agamas). Gardens filled with exotic plants tend to have a worrying lack of wildlife. Yes, Bougainvillea and Marigolds etc may look pretty, but they won’t attract much. Plus, plants like Bougainvillea smother other plants. Imported plants have caused our national invasive alien plant crisis. This has a major negative impact on the environment and the economy. There are many indigenous, and gorgeous, alternatives. Want to contribute to conservation? Well, this is one of the easiest steps. Plant indigenous. Surround your flower beds with logs. Either let fallen leaves remain undisturbed, or sweep them up and scatter them among your flower beds, to boost the health of your soil. Leaves, logs and rocks are perfect ‘homes’ for many different creatures too. A pond is one of the best magnets for wildlife, so consider that too. Yes, it may attract mozzies, but then those will attract frogs, who’ll eat the mozzies for you. Chameleons don’t occupy every indigenous garden, especially if there is no suitable natural habitat nearby. You may have to wait a little while for chameleons to move in. You won’t have to wait too long for the birds, insects and other reptiles to move in though. If you are someone with an indigenous garden, THANK YOU! You’ll know what a difference it makes. You don’t need National Geographic to see nature in action, you just need to step outside.